I love the bewildered look on people’s faces when I answer “busy” when they ask how the farm is during the winter. You see, there is this illusion that farmers don’t do much when it’s cold. But that couldn’t be farther from the truth. Growing in the South is a year round job. Our climate is such that we can work outside the majority of the year and have things growing year round. This is a blessing and a curse. It means you have to create your own down season. Although this past winter, the rain has created plenty of down time. It’s the first winter that I’ve run out of inside work to do during the rain. I’m usually looking for rainy days so I can finish my crop planning and paperwork! 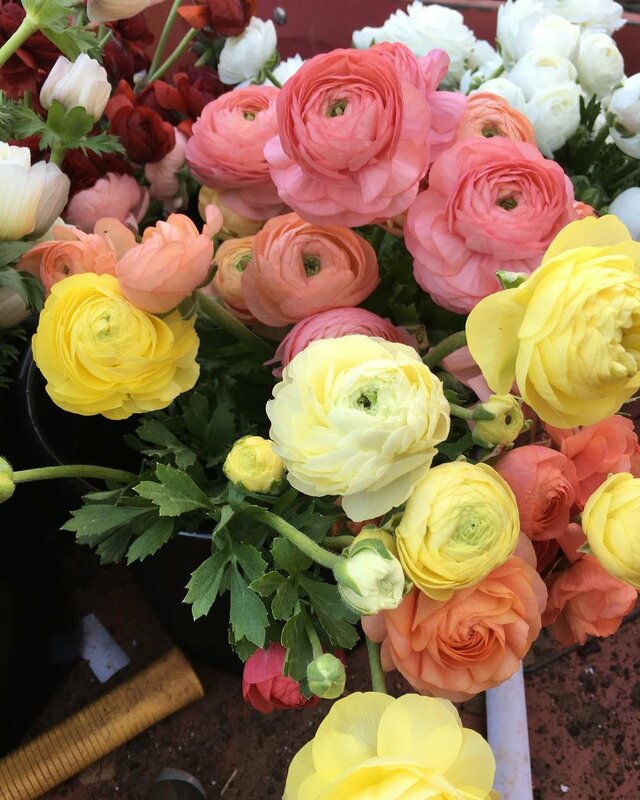 November brought loads more planting— 1000’s of ranunculus, anemones, and poppies! December roared in like a lion with the first snow storm of the season (and only snow storm so far). Spent lots of time crop planning, ordering seeds, plugs, and plants! January finally brought about some sunny days and we started building our first hoop house on the farm. It’s still a work in progress but it’s getting there! February brought the first flowers of the season-sweet little anemones. We sold a few for Valentine’s Day! Spent a good part of February sick with the flu but managed to get well enough in time to attend the ASCFG “Business of Flower Farming” Conference in Denver. And that brings us to here, the first day of March. It’s pouring rain outside as I write this but hopefully after a brief cold snap next week, the sun will shine and the flowers will burst forth! If you’d like a chance to play with these beauties, sign up for one of our Spring Workshops! Everybody starts somewhere. My experience with cold hardy annuals began back in 2012. (By the way, cold hardy annuals are just that--- plants you seed in the fall that have enough cold tolerance to make it through the winter and bloom in spring). This was before the term "cool flowers" became popular. But I began seeing other farmers north of me that had flowers in May and early June. So i figured if they could do it in their cold climates, why couldn't I? In early December, I stamped some soil blocks, seeded larkspur, nigella, feverfew, and bachelor buttons. Then I waited and waited because larkspur takes awhile. But finally in early January, I began to see signs of life. Tiny little sprouts pushing through the soil. I popped the soil blocks under my grow lights and continued to water. In about a month or so, I was ready to plant out. It was mid February by this time and half of me totally doubted what I was doing and the other half said-- what have I got to lose? So in the ground they went, through frosts and snow. By late March, they began to really bulk up. 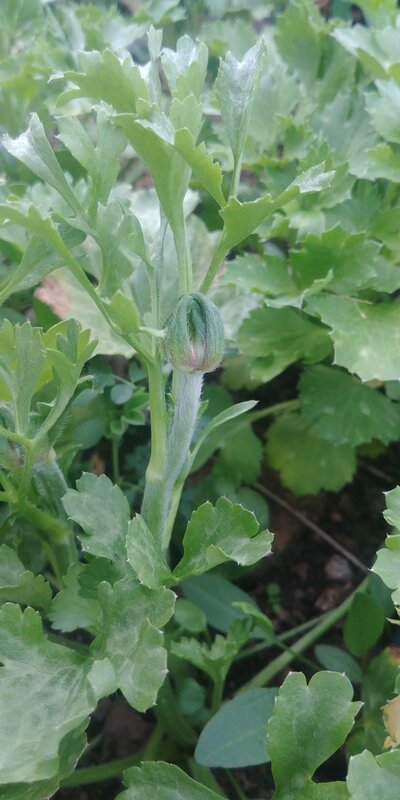 I got really excited, thinking that flowers were coming very soon. Well as it turns out, when you don't plant until February, you don't get flowers until late May. But nevertheless-- they were gorgeous! I'd never had so many beautiful blooms in all my life. I filled vase after vase and then some, gave them away to family and friends and the garden was still full! I was completely hooked! Ever since then I've been expanding my repertoire of cold hardy annuals. Each year, I push the envelope a little bit and see just how much cold different varieties can take. I now grow ranunculus, anemones, scabiosa, poppies, and loads of other beautiful blooms. You can do it too-- a few seeds, a little patch of earth and nature does the rest. On September 10 and 11, I've got a great workshop at the farm to teach the basics of cold hardy annuals. We'll cover soil prep, how much water your plants need, how your plants handle the cold, and all the beautiful varieties you can have blooming as early as March! Come join us! About 10 years ago now, we spent a year in Scotland. My husband was doing some studying for a master's degree and we were young and a had a bit of wanderlust to see the world. We moved there in fall which is basically like our winter. For this southern girl it was a big adjustment! It was the coldest, darkest, grayest winter I remember. However in March, little green shoots began to pop up all over. Those were soon followed by small cream colored buds that burst forth into beautiful yellow cup shaped flowers. Everywhere we would go- daffodils! I don't think I've ever been more excited to see their cheery faces. Imagine green rolling hills with baby lambs frolicking everywhere and cute pops of yellow flowers swaying in the breeze- yes, it really was like a scene from a movie. My rows of daffodils don't quite have the same affect and I often hear pigs squealing in the background but I can imagine I'm back there with just a whiff of their sweet scent. Daffodils have definitely enjoyed a surge in popularity over the past few years. They become more than just the standard yellow cup shaped bloom. Peaches, pinks, and cream varieties are becoming more widely known. We grow a few varieties of specialty types here at Fraylick Farm. My favorite is in bloom right now- Erlicheer. She is a dainty but tough little flower- a beautiful spray of cream colored flowers. She opens with a bit of yellow in her petals but within about 24 hours they turn completely cream. She has a very intoxicating scent and is the strongest of any variety we grow. Each variety is only around for about 3 weeks so you have to enjoy them quickly. White Lion and Mt Hood come next in our succession. Mt Hood is similar in shape to the standard daffodil but completely creamy white in color. It opens with a yellow cup which changes color within 24 hours to all white/ivory. White Lion is a single bloom type with a beautiful double ruffly center. It opens with some yellow and then turns all white. (do you notice a theme here?) I definitely prefer the creamy white varieties. We do have some peachy centered types in our later varieties that will be blooming in a few weeks. Some people shy away from daffodils because of their sappy reputation. When cut the daffodil emits a sticky sap like substance. This sap can be bad for other flowers in the vase if the daffodil is not conditioned properly. The bulletproof method for conditioning daffodils: Give the daffodils a fresh cut, place in a vase with clean water with no other flowers. Add flower food or a CVBN tablet (often called a gerber tab), or a bleach solution (1-1 1/2 tsp /gal) for 2-5 hours. This allows the sap to drain out of the stems. At this point the stem should not be recut as the sap will begin draining again. Now-- any designer knows, not recutting is just not practical! There is no way to know the exact length you will need it. This is why I only recommend daffodils as an event use flower. Event flowers don't have to have the extended vase life and only have to look good for 2-3 days at most. In my experience I've never seen daffodil sap take down other flowers in that amount of time. A lot of designers love using them in bouquet work. I recommend after you wrap your bouquet and make the final cut to change the water in the vase after an hour or so. This allows the daffodil stem to drain but if you change the water after awhile, you should be good to go. Also including flower food or a few drops of bleach in the water of any vase or arrangement is a good idea when working with daffodils. Remember the sap reduces vase life, it doesn't kill the flowers outright. Daffodils scream spring and a few extra steps shouldn't be cause to avoid them. They add that touch of seasonality that is becoming a huge part of modern day design. But they won't be around for long so grab them while you can! As our year living abroad passed, we began to dream of having some land of our own and moved back to the US and settled in South Carolina. We bought a house with a really large yard- big enough for a good sized garden. I began to grow veggies and I also took my first formal gardening training ever- the South Carolina Master Gardener Certification. I had no idea it would be like going back to college but it was a good overview of growing/gardening/botany etc. I still loved flowers but was growing mainly vegetables to put on our table. I was self-employed as a motion graphic designer at the time but for multiple reasons was looking for a new career. Finally one day it just hit me-- why not turn this love of flowers and gardening into a business? So I did what most people do-- began researching! Read all the books, found all the blogs, and ordered all the seeds. I took over half my veggie garden with flowers that summer. I still remember my husband quipping about how "we can't eat flowers". I grew larkspur, bachelor buttons, dahlias, zinnias and sunflowers. The next year my husband managed to secure some rented land a few miles from our house. He raised a few pigs and I began my first real flower field- if you can fall a 1/4 acre a field! And - WOW!-- did I learn some lessons that year! The field was in the lowest part of the property- basically a glorified drain field. It had the most compacted soil I had ever seen (and I live in the land of clay). We tried running a BCS through it to till and couldn't get it to go more than an inch deep. So my learning process began. I learned about drainage and soil building that year and how poorly flowers do in compacted soil. Year three- My awesome husband generously let me use the field he had been running his pigs through for awhile to scale up my operation. And let me tell you-- pigs make some good dirt! It was a world of difference! I still struggled with some logistics like learning how to drive our tractor, plowing with the contours of the land so your crops don't flood and all those beginner mistakes. But I began to see that this flower farming thing was feasible! It was also the first year I really tried to sell my flowers. Some avenues worked out great and some didn't but I'm glad I tried them. Cut to July of year three- We had been planning for some time to move and get our own land. We weren't exactly sure where but had been looking toward the Upstate of South Carolina. One day my husband gets a call from a recruiter, gets a job interview for later on that week, gets offered job and accepts 5 hours after his interview. Ok- we're moving - just like that! It was several months ahead of our timeline but things never go as you plan them (#1 rule of farming right there!) His new job was in Greenville so we put our house on the market, began looking for some land and 3 months later were settled on our new farm in Travelers Rest (if only it had been as easy as I just made it sound-- try moving pigs in the rain when your livestock trailer gets stuck in the mud!). Moving a farm isn't easy and not something I would recommend. However, the chance to start new and fresh and correct all our beginner mistakes was invaluable! So much hard work but now that we are through most of it, I wouldn't trade it. By this time I knew what I wanted to grow- wedding flowers- and who my customer was- florists. Fortunately we moved in the fall so I had a whole winter to get my game plan together. I had already begun establishing relationships with florists in the area and I did tons of research to figure out what flowers they wanted. I also made it a priority to get to know the other farmers in the area. I was friends with one already and started contacting others- having coffee, farm tours, etc. Anything to get to know them better. This is where the idea of a local flower farming community was born. In February of 2016- I asked every flower farmer I knew and told them to ask any farmers they knew to come to a potluck lunch at my farm. Over good food and good conversation, SC Upstate Flowers was formed. A group of farmers existing for the encouragement of one another and sharing knowledge and also for figuring out how to serve our community with the freshest blooms possible. 2016 was a great year- a tough one in which I learned a lot about balance- growing for production and trying to establish your farm and move everything from 2 hours way isn't easy. 2017 was an even better year- equally hard but in different ways. This past year I learned about making my farm work for me- but that's a story for another day. So that's my story. How did you get started farming? Where did your love of flowers come from?